Mondays making you blue? Here’s a mineral for you. Afghanistan isn’t exactly known for it’s great wealth of natural resources, despite the hullabaloo last year over the recently re-discovered mineral deposits in the county. What Afghanistan does have is a mineral named after the country. Afghanite has the impossible chemical formula (Na,Ca,K)8(Al6Si6O24)(Cl2,SO4,CO3)3· 0.5H2O. It was discovered in the late 1960’s in a remote northeastern corner of Afghanistan known as Badakhshan. Badakhshan is one of the poorest, most remote corners of the world, nestled in the Hindu Kush Mountains, and bordering both Tajikstan and Pakistan. Its one claim to fame is the mining of Lapis Lazuli, a gorgeous blue rock favored by ancient civilizations like Egypt and Rome. 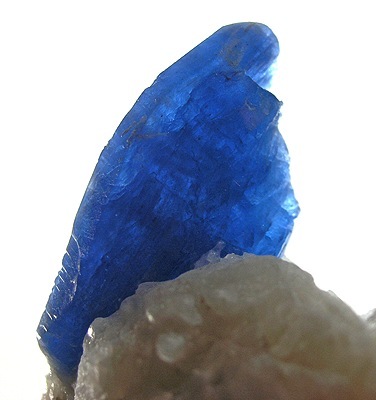 Afghanite was discovered in a Lapis Lazuli mine in this area, but has since been found with other blue minerals like sodalite in locales around the world. Afghanite shares the deep blue color of Lapis Lazuli rocks, mainly because it has a very similar molecular formula to the mineral Lazurite. Both are members of the impossibly large tectosilicate mineral grouping. Tectosilicate minerals make up nearly ¾ of the Earth’s crust, and are made up of lovely little tetrahedrons of the very common elements silicon and oxygen (with aluminum subbing in for silicon just for fun). These tetrahedrons build upon each other in predictable ways, creating a framework for the crystal structure of any tectosilicate mineral. (Tectosilicate literally means framework silicate). Afghanite, unlike other tectosilicates like feldspars or quartz is not particularly common nor useful, but it is lovely and unusual, and deserves its 15 minutes of fame.